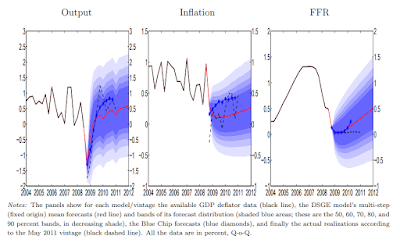 The shock transitions are in 1992.0, 2002.4, 2009.4, and 2014.7 which all follow the related shock to unemployment. 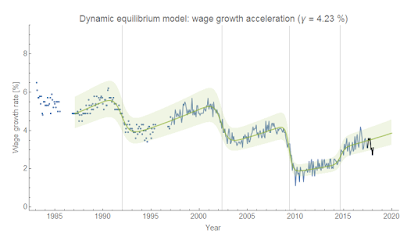 A negative shock to employment drives down wage growth (who knew? ), but it also appears that wage growth has a tendency to increase at about 4.2% per year  unless there is a positive shock to employment (such as in 2014) when it can increase faster. The most recent downturn in the data is possibly consistent with the JOLTS leading indicators showing a deviation, however since the wage growth data seems to lag recessions it is more likely that this is a measurement/noise fluctuation. The time series is broken before 1997, but data goes back to 1983 in the source material. I included data back to 1987. However the data prior the 1991 recession does not have the complete 1980s recession(s), so the fit to that recession shock would be highly uncertain and so I left it out. Wage growth it typically around 3.0% lately, so a 4.2% increase in that rate would mean that after a year wage growth would be about 3.1% and after 2 years about 3.3% in the absence of shocks. Are interest rates inexplicably high? JOLTS data ... and that market crash? When did we become gluten intolerant?